We are the leading suppliers for MP3 Module Fn M16P. 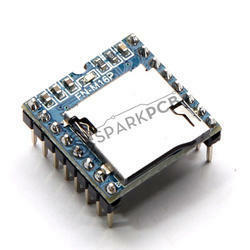 FN-M16P is a small and low price MP3 module with an simplified output directly to the speaker. The module can be used as a stand alone module with attached battery, speaker and push buttons or used in combination with an Arduino UNO or any other with RX/TX capabilities. HAPPY BIRTHDAY TO YOU - FOR birthday invitation card electronic sound modules. Named the "Synthesizer of the Year" at the 2004 MIPA Awards, Roland's groundbreaking V-Synth now has a travel-friendly offspring. The XT is a portable new V-Synth with some spectacular tricks up its sleeve. telephone type keypad that lets you open the door when a previously programmed 6 digit code is entered. Module to incorporate in panels with viewer. Plastic Sound Accessories is the main product that we are dealing into. A set of equipment for the reproduction and amplification of sound. We Are the leading manufacturers of customsed sound modules Sound modules in india. one can customised sound modules by giving sound/voice files rangin from 1 sec to 500 sec. This Module will turn your favorite music into light effects, a microphone picks up the sound and gives great light effects with 6 Red LEDs, ideal for creating fun atmospheres at parties & discos. supply 9V-12V DC.